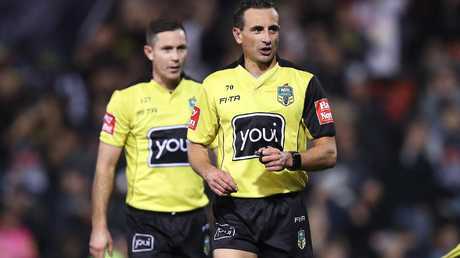 The 16 NRL clubs will be handed a document this week confirming the crippling effect of the refereeing crackdown on the 2018 season. 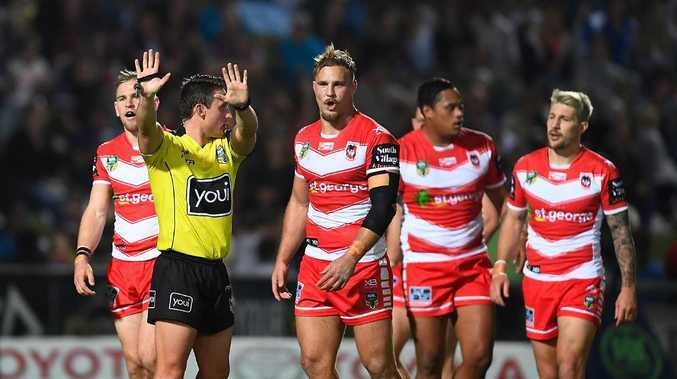 It reveals fans saw eight hours less ball-in-play action over the season, fewer tries and linebreaks, but a 200 per cent increase in penalty goals. 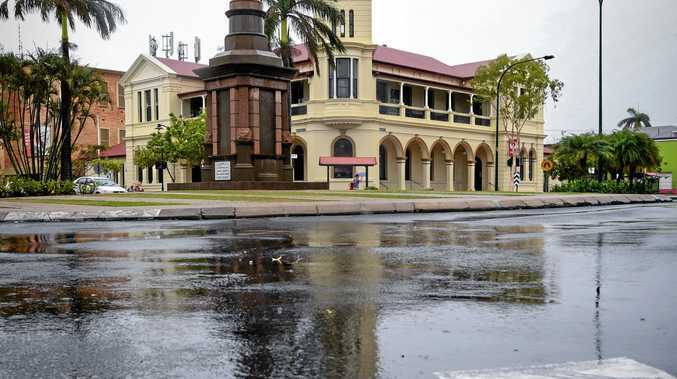 There was also a 10 per cent increase in the number of bunker referrals and a 17 per cent increase in the time it takes to adjudicate on a try referral. The Daily Telegraph has obtained a copy of the confidential document which will be handed to the 16 club chief executives at their meeting at Moore Park headquarters this week. 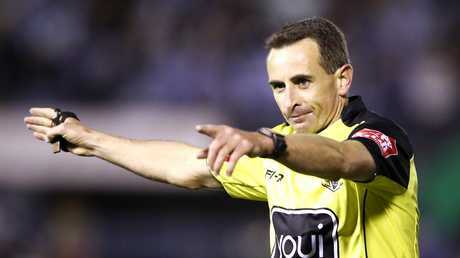 The controversial penalty crackdown interrupted much of the season. Photo by Mark Kolbe/Getty Images. Despite reports to the contrary, the analysis of the 2018 season shows television ratings in Australia were actually down on 2017 although nowhere near as severely as the AFL or soccer's A-League. In fact for the first time since 2010, rugby league recorded a higher season audience than the AFL. TV ratings on Fox Sports increased but fell on Channel 9's free-to-air coverage. The idea was to speed up the play-the-ball, keep the teams further apart and improve the attack. The report shows it actually did nothing to enhance the spectacle. It actually had the opposite effect. It is the major reason why long-time official Brian Canavan was axed as Head of Football and replaced by Graham Annesley. The referees are in crisis. Picture by Phil Hillyard. There were 75 fewer tries than the previous season, fewer linebreaks and a 200 per cent increase in penalty goals. Some games were like boring rugby union penalty shootouts. With less fatigue from all the stoppages there were also fewer missed tackles. At least Todd Greenberg recognised there was a problem after round 14 and abandoned the crackdown, ordering the referees to stop nitpicking. In 2017 the ball was in play for 58.9 per cent of the game. This year it dropped to only 55.8 per cent. In comparison, the ball was in play for 60 per cent of the game in Origin I in Melbourne because of fewer penalties. All up fans lost eight hours of play over the full season. This is one area new Head of Football Annesley is desperate to fix. While he was still chief executive of the Gold Coast Titans in September, Annesley flew to Sydney to watch a Friday night match from the bunker. He has already had meetings with key refereeing staff to work on ways to improve it. There are suggestions the man responsible for the crackdown, refs boss Tony Archer, will not survive. The salary cap is obviously working. Games are tighter on the scoreboard than ever before. The average winning margin in games was 12.8 points, the lowest in NRL history. There was also an increase in the number of games decided by four points or less (29 per cent). During the season there were six different TAB favourites (Sydney Roosters, North Queensland, Melbourne, St George Illawarra, Penrith and South Sydney) to win the competition. There were six different premiership favourites through the season. Picture by Phil Hillyard. Overall numbers in Australia were slightly down. The average viewership on Channel 9 fell by seven per cent but Fox Sports was up by six per cent. The AFL and the A-League were both down 13 per cent on free to air. On pay TV the AFL was down seven per cent and the A-League fell by a whopping 23 per cent. Encouragingly for the NRL, ratings improved in New Zealand on the back of the Warriors' success. The NRL's digital subscriptions also doubled. Some positive results for the NRL with crowds up 2.2 per cent in a tough entertainment market. Fans purchased 333,000 memberships, which was an increase of five per cent on the previous year. Memberships grew at 13 of the 16 clubs and nine clubs achieved record numbers. There was a huge growth in female numbers (28.9 per cent). The biggest growth area was in the younger age groups where participation increased by almost 40 per cent. The first ever NRLW competition plus the success of the Jillaroos and State of Origin game at North Sydney Oval obviously helped. Overall numbers increased slightly (0.4 per cent) in male playing numbers. But 13 to 15 years and 16 to 18 years age groups both fell. This is why the NSWRL plans to introduce League Tag to keep teenagers involved in a game without the body contact. New Panthers coach Ivan Cleary did his first interviews since walking out on the Wests Tigers but refused to apologise to the fans he abandoned on the bus. The International Rugby League Federation now has a chairman, Graeme Thompson, and a CEO, Nigel Woods. Both are from the northern hemisphere, despite the strength and future growth potential of international rugby league now being Australia and the Pacific Islands. It is a joke. The Parramatta Eels' new recruit Blake Ferguson at the Oatley Hotel on Saturday ... drinking orange juice. He has been off the grog all year. Which Wests Tigers star is deeply concerned about his future at the club now that Michael Maguire will replace Ivan Cleary as head coach? Which representative forward has been told by his new coach to look for a new club or play NSW Cup next year?